so those good folks at rockiowa.com just finished editing a couple of videos from Beati Paoli’s cd release show back in september. i can’t embed the videos on wordpress, but the live performance of the song, “A Sense Of Urgency”, has been posted on the Beati Paoli video page: www.beatipaoli.net/video.html. and on their myspace page: www.myspace.com/beatipaoli. 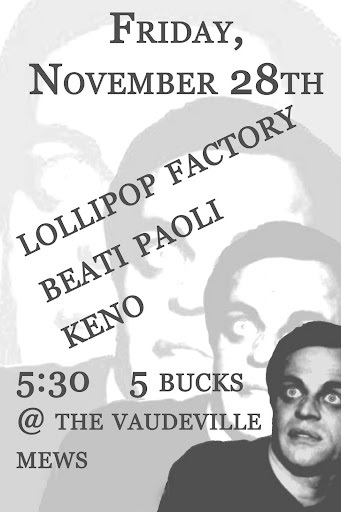 and if you’re in the des moines area and all done with your holiday parties, come out to the vaudeville mews tonight. Beati Paoli was written about recently in the daily iowan. Hey all. Just a quick word to let you know that Beati Paoli’s new album “A Sense of Urgency” is now available on iTunes! For ten cents cheaper than the physical copy, no less. So inbetween buying episodes of “Desperate Housewives” and “Steve Wilkos”, type in “Beati Paoli” and check it out! or you can just click on THIS LINK! The Ottumwa Scene Online just reviewed the new Beati Paoli album, “A Sense Of Urgency”. Des Moines Band, Beati Paoli (pronounced BEE-ah-TEE POW-lee), don’t distinguish themselves by making stricktly pop rock, noise rock, or acid rock. Nor do they specifically make indie rock, art rock, or post punk rock. Beati Paoli manage to incorporate all of these styles of rock and roll, and probably a few not mentioned here, in the groups first full-length album, 2008’s “A Sense of Urgency”. Beati Paoli aren’t suffering from an identity crisis, however, they just seem to prefer their music this way. The crazy thing is that it works to a point of near perfection! The album is a cleverly woven listening experience to say the least. “A Sense of Urgency” (track 2) is a good overall song to get the vibe of the album from a pop perspective. The song features some serious vintage sounding fuzz, and some great sing along style lyrics. For a more experimental indie feel of the band, “You are my Megalodon” (track 9) is a surefire winner with some stealthy and smart vocal work, a lengthy wavy-sounding intro, and a mishmash , noisy, outro. In fact, “A Sense of Urgency” lives up to the albums title in as much as at times the music seems on the verge of complete musical meltdown. Portions of “Girl Friday”, “Vulgarity Drifting Diary” (track 5), and “You are my Megalodon” are good examples of this. However, listening to the way the band layers their sound and manages the possible perceived disorder, this meltdown is indeed a Beati Paoli controlled blast. The group manage to balance the tight wire act of musical experimentation and yet still retain the bands melodic sound. After a few listens of “A Sense of Urgency”, this chaos begins to look more and more orderly. What would be truly be chaotic were to be if Beati Paoli were to make strictly cookie-cutter pop songs, denying the listeners their abilities with the sound they display on this album! “A Sense of Urgency” was produced by Beati Paoli, recorded at Smoking Guns Studio in Des Moines, and released the Beati Paolis newly launched label “the Noising Machine”. Beati Paoli are Gregory Goode, Ryan C. Meier, Scott O’Gara, and Cecil Skrdlant. The band has been together since 2005 and have toured the United States extensively. Today was our CD release show for our first album, A Sense Of Urgency. Two shows, an early all-ages and a late 21 +. Support for the early show came from Adam Robert Haug and The Poison Control Center, while Ross Moffat and Maxilla Blue played with us at the second. For these two shows, we played the entire album. It was kind of a “listen before you buy” thing. All and all, we all think it was a great success. Thanks to everyone who came out, whether it was to see us, one of the other bands or both. We greatly, greatly appreciate it and it got our tour off to a good start. The real first day of the tour, though going to Omaha was downright leisurely compared to some of our other first-tour-date drives. Wanted to leave at 2, ended up leaving around 6:30. This is pretty typical. Spent short Omaha drive getting acquianted with Guitar Hero: On Tour for DS (Verdict: pretty fun, but don’t play for more than 15 minutes at a time or you’ll get carpal tunnel) and watching the first three episodes of Xavier: Renegade Angel, an Adult Swim show created by the guys who did Wonder Showzen. Even though I’ve lost touch/become disenchanted with Adult Swim’s penchant for randomness for randomness’ sake, I liked Wonder Showzen a lot and this was in the same vein. So funny, basically. We were supposed to play at another venue in town for this date but that fell through, so Adam was nice enough to let us play at his house, The Hotel Frank. It’s basically two large, old houses connected by a thruway where apparently, under various different names, it’s hosted tons of shows throughout the years. This show was played in the east wing of the house in a living room with Adam and a band called Honeybee. Honeybee was pretty good, they’re suited for this kind of show. I don’t think we are, though. It was ok, but I felt a bit awkward stripped down and I’m not sure if the kids took to us much. Oh well. Adam was really fun, as always. After the show, most of the crowd went on to another house show. I’m lame though, so I went to sleep instead. Oops! Woke up, played with cats aroud the house. We went a couple houses down to McFoster’s, an awesome natural foods restaurant. I got the Mexican omlette with pineapple papaya salsa. Excellent. Afterwards, we made the rounds to the local record shops in an attempt to get our album stocked. Succeeding in stocking one; have to call the other ones to make special arrangements. The one that let us put records in, The Antiquarium, had a “Box of Jandek” on the counter though, tons of assorted Jandek albums for $6. Weird. Bought some windshield wipers!!! Picked up Adam from the Hotel Frank and headed out for tonight’s show in Lincoln. After getting stupidly lost, finally found the venue, Box Awesome. Tonight we played with an interesting instrumental act named Mwumbles and Adam again, marking the end of the brief BP/ARH tour. Darren Keen, who basically is The Show Is The Rainbow, was supposed to play with us, but didn’t show. After we played our set to virtually no one, we had to clear the stage for the late show, some reggae nerd named Jah Roots. As we were loading up, Darren came up and apologized. He had thought it was a late show, and was watching an episode of The Shield when he realized. Oops! But he was a nice guy, honest mistake. It was only as we were leaving that Adam mentioned that Darren is the bass player in a band on Saddle Creek called Beep Beep. Mandy and I both think Beep Beep is awesome, so I would have liked to ask him about their new album and stuff. Oh well, maybe next time. This show was also notable as George, Scott’s uncle joined up with us. He’ll be coming along with us on the road until the 20th, or until he gets bored. Which will probably be tomorrow! Oh well, on to Wichita…. this is the last song we needed to upload in order to have EVERY SONG from the new Beati Paoli album, “A Sense Of Urgency”, available online. it’s track 8 on the album, and it’s also streamable on Beati Paoli’s Myspace, Beati Paoli’s Facebook, and The Noising Machine Website. AND, like all the others, you can add it to your facebook or desktop players through Beati Paoli’s ilike.com profile. the snocap store doesn’t seem to be working at the moment, so the song hasn’t been uploaded there yet, but DON’T WORRY, we’ll upload it as soon as we can. Beati Paoli cd release shows! the line ups are amazing. great bands. friday, september 5th @ the vaudeville mews! brent houzenga did the art for the flyer. check him out.